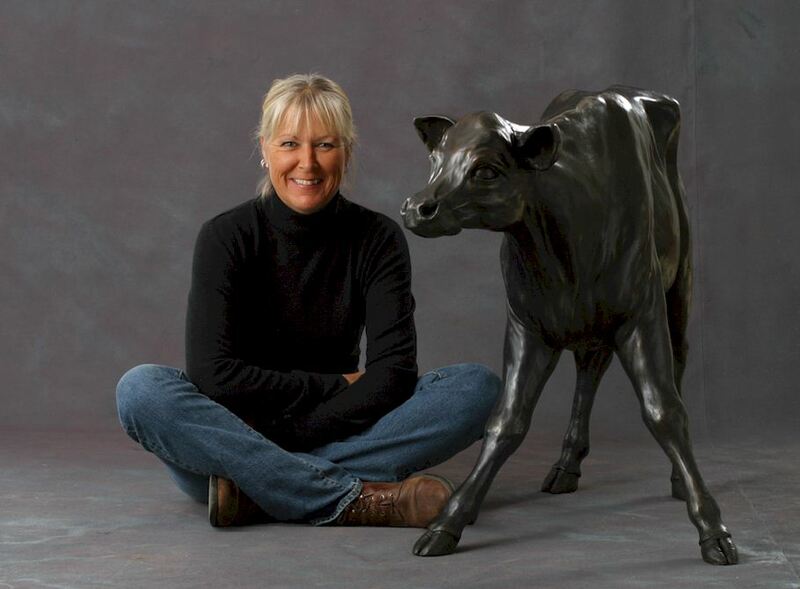 Nicola Prinsen knows visitors to the White Rock Gallery are going to find it hard not to pet her bronze calf. The appealing little critter, thigh high, just cries out for a pat of comfort. “That’s good,” she said during a recent visit to the gallery. 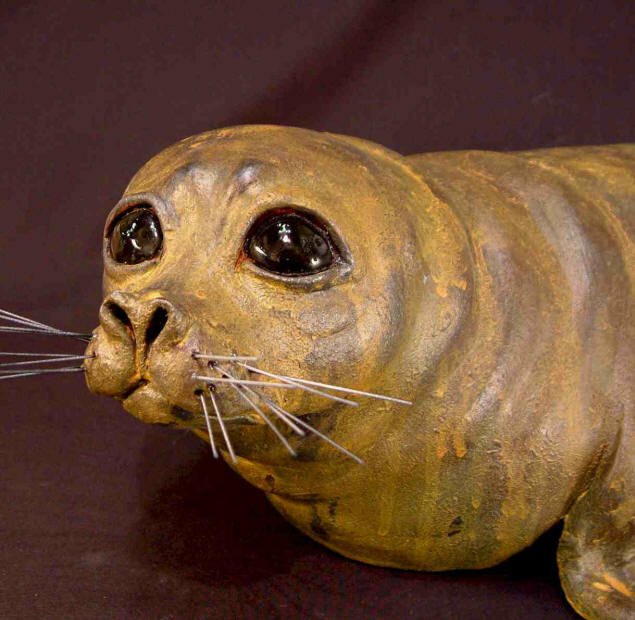 The pettability factor is a tribute to her skills as a sculptor which seem to breathe life into both her realistic and her stylized work. 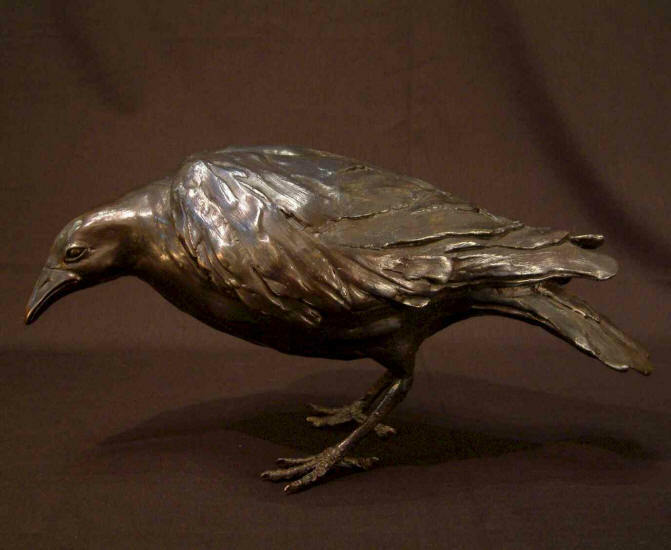 But, the affable sculptor, quick to see the humour in any situation, also feels a great affinity for her creations. And she has them around in her Saltspring Island home, a converted 1926 “big old dairy barn” complete with its original cowstalls and milking stanchions on the lower floor, where she has a 1,200-sq.-ft. studio. “I’ve had sheep in the living room and we’ve been thinking about taking the cow upstairs,” she said, referring to a life-size clay sculpture she has previously presented at the gallery. 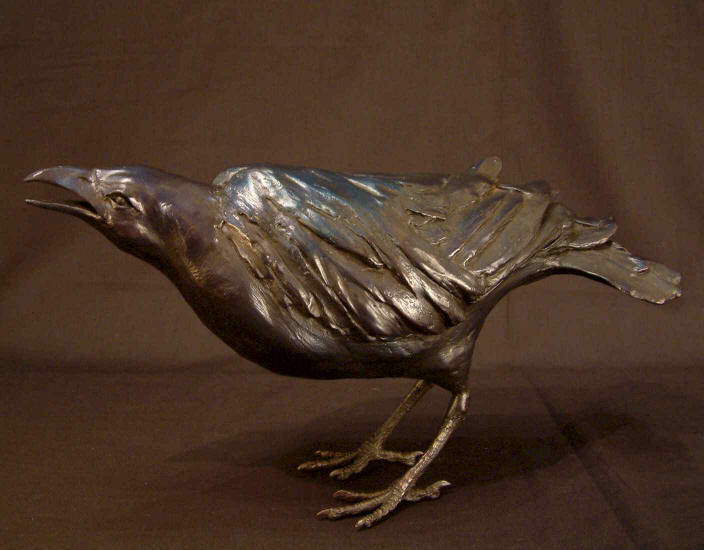 Prinsen, who grew up around horses and other animals in Surrey-Langley, still finds them a central presence in her art, even though she has done some figurative sculpture in the past. “Saltspring is very rural,” she said. 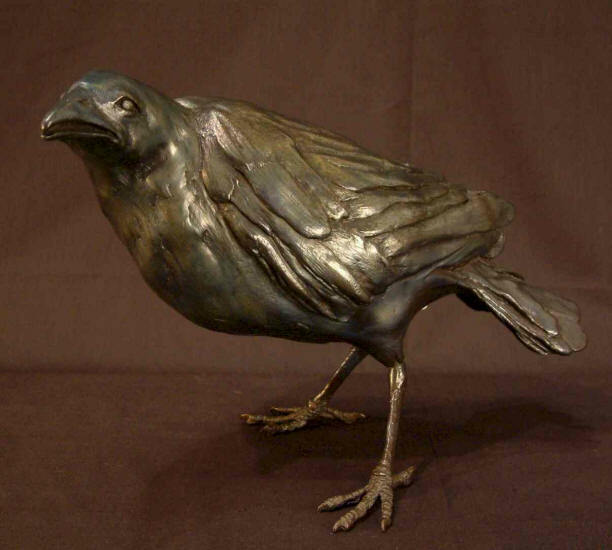 “All three have found their way into her upcoming show at the gallery, featuring original fired clay pieces and limited edition bronze pieces. “Cows in particular,” Prinsen said. She points to another bronze in which the form of the cow has been distorted to the point of caricature, albeit sympathetic. New to her menagerie are rabbits, which she has depicted in varying forms of stylization. “I call this one Fast Bunny, she said, pointing to a galloping rabbit. “This one evolved after that, so I called it Fast Bunny II. Another sculpture, she calls it Laughing Horse, rests on its rounded, distended chest — a result of an experiment to create a rocking figure. 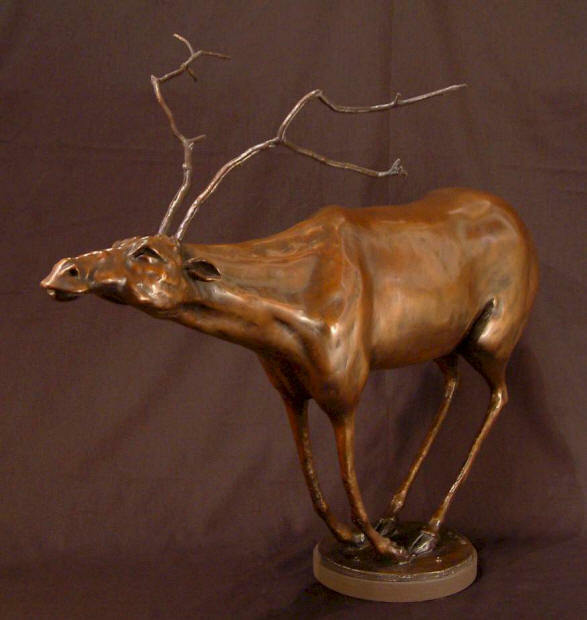 Others, like her caribou, have used sticks for stylized legs and antlers. 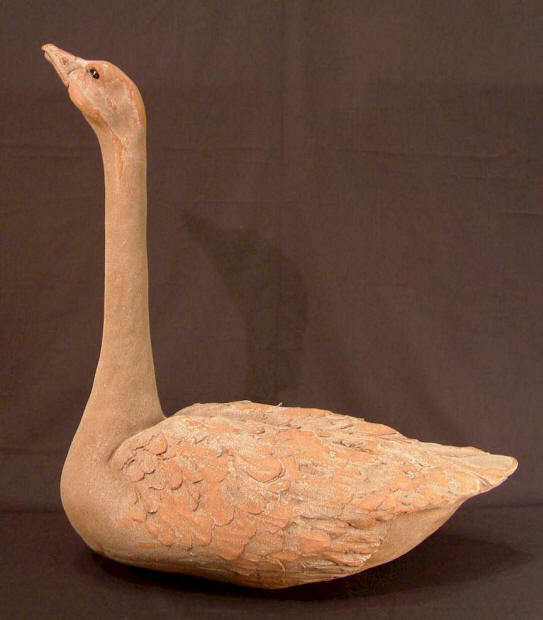 Some larger clay pieces would be impractical to turn into bronzes, Prinsen said, given the logistics of casting bronze in the lost wax process, which requires urethane rubber moulds made from a clay original, an outer shell, and complicated armatures. The upper limits of size are tested by her calf — which may weigh as much as 375 pounds. “She is hollow-cast bronze,” Prinsen said. That creates its own set of challenges, she said, including ensuring the majority of the sculpture is of equal thickness. “If you have a lot of different thicknesses, the thinner stuff cools faster — and then it twists,” she said, pointing to the calf’s head. She can never quite escape the fanciful. “The magical thing about bronze is that you can defy gravity with it,” she said. The upcoming show is an unusually large collection for a sculptor to exhibit at one time, Prinsen acknowledged, and represents a year of quite intense work. And even though it can become quite addictive, she said — what she refers to as ‘the bronze bite’ — she’s looking forward to some time off. Fortunately she has an understanding and supportive partner, Vern, with a master’s degree in arts from Concordia University. 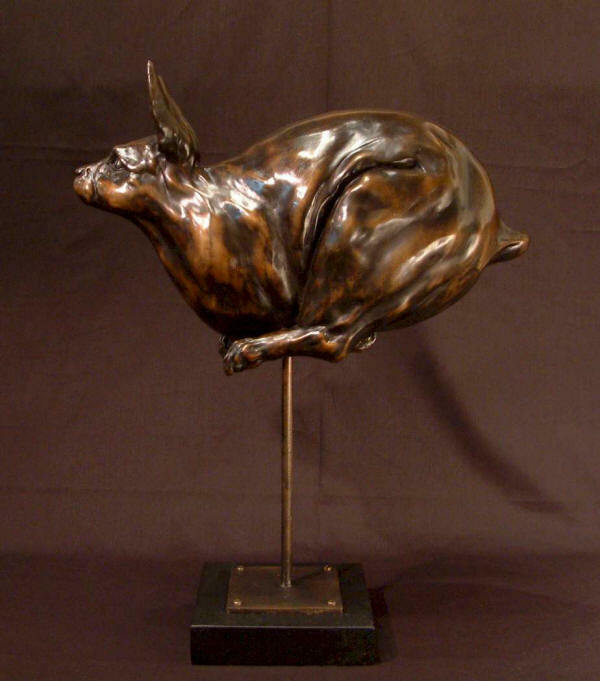 Prinsen admits the intensity of the work has a lot to do with her endless experimenting with finishes and colour patinas on the alive surfaces of pieces like her rabbits and crows — and the endless structural challenges she throws out to the bronze casters she works with. She’s always been aware of her desire to push boundaries. “When I was three, my mom sat me down and told me ‘All across Canada there are square holes — and you’re a round peg’,” she laughed. 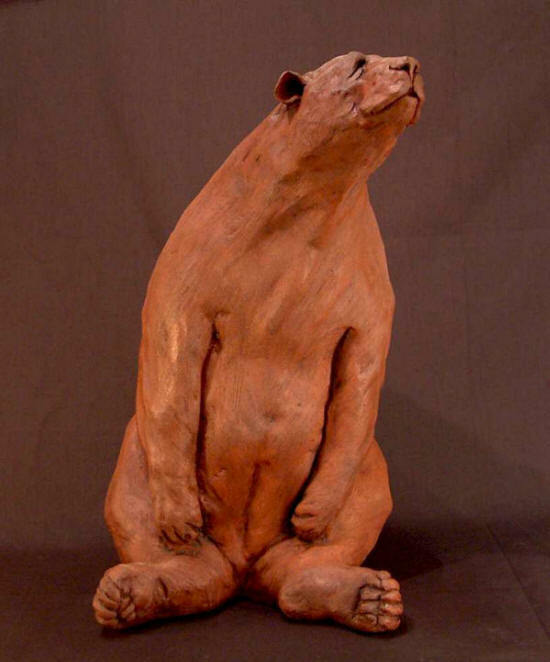 The sculpture of Saltspring Island artist Nicola Prinsen is inspired by the otters, crows, goats, horses and other creatures of her rural setting. 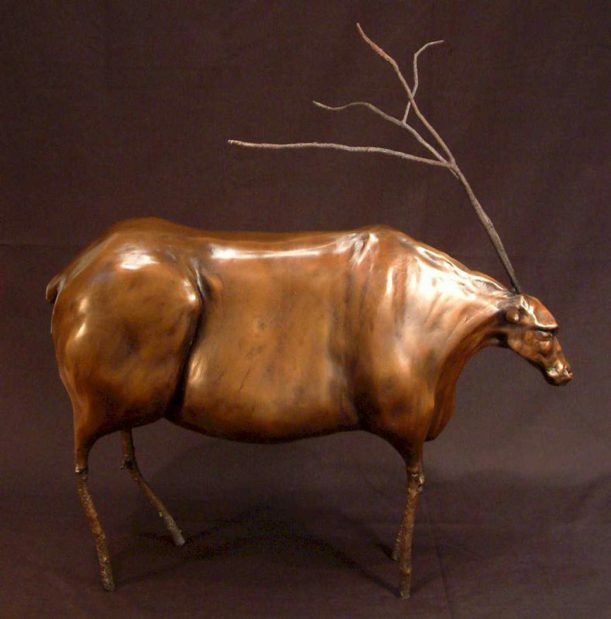 Many of her pieces are straightforward, life-scale representations of wildlife and domestic animals. Her fusion characters border reality and fantasy. Prinsen is capable of exquisitely rendered realism. She has a good eye and sound technical skills honed by studies at the University of Alberta, the Zeljko Kujundzic Northern School of the Arts and the Vancouver Academy of Art. 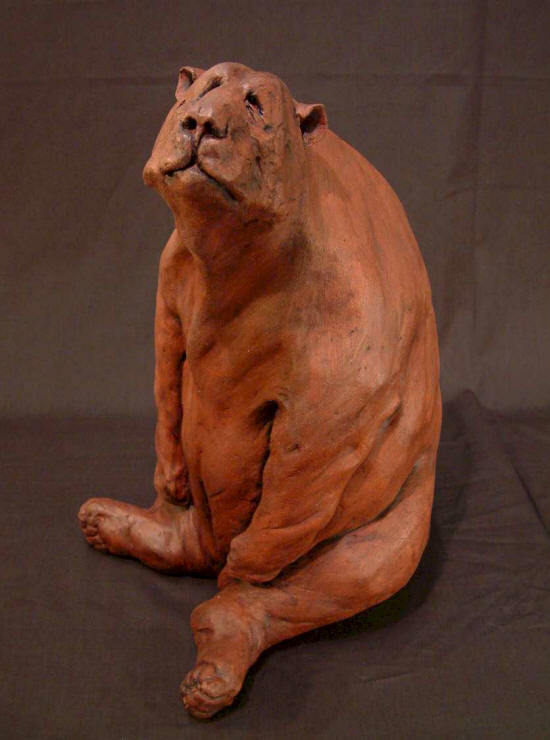 Her work has been described as “veiled in humour” because, in many of her bronzes and fired clay sculpture, she exaggerates the personalities and temperaments of the animals by distorting their physical appearances. If the term “anthropomorphic mannerism” could be coined, it would certainly apply to a bloated sway-back horse, a “radiant” cow whose udders graze the ground, or an enormously fat cat. 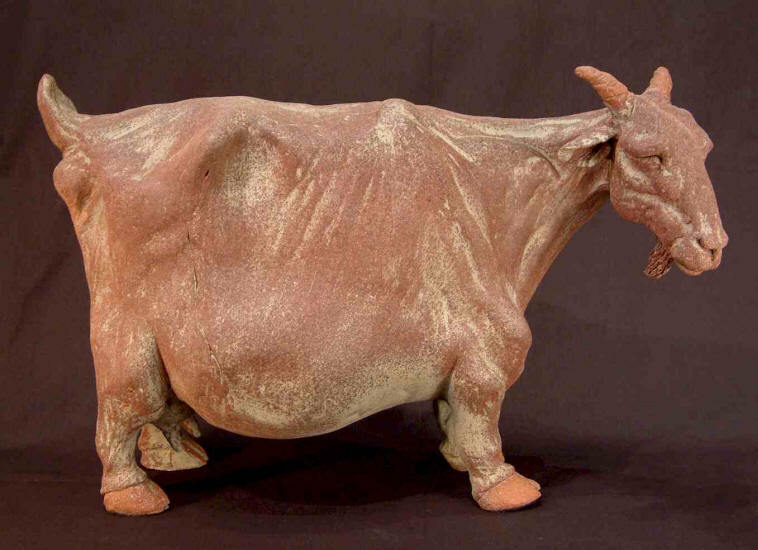 Her sense of humour is evident in a work like “Jane (Gal from Saltspring)”, a three-quarter life size, fibreglass-reinforced, gypsum cow. 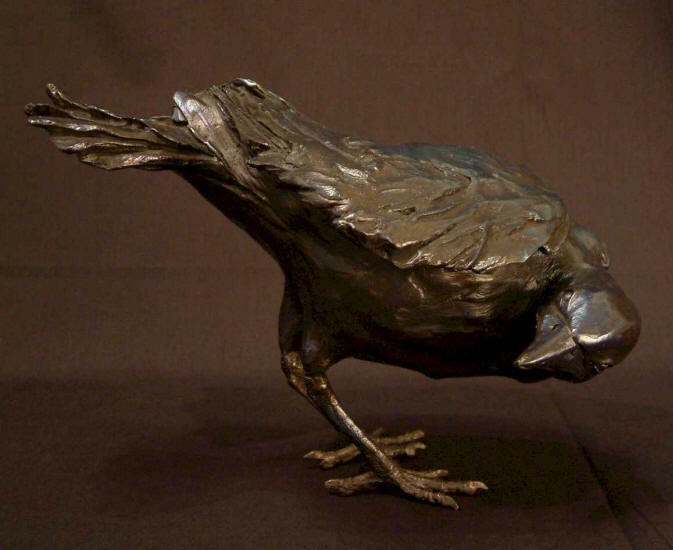 Like the Canadian sculptor Joe Fafard, Prinsen seeks to amuse and entice the viewer. Pushing the boundaries of art and reality is her motivation, rather than social causes. 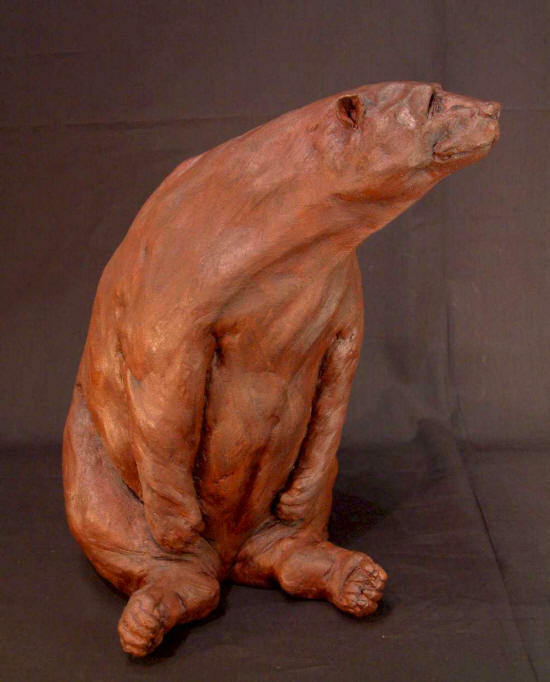 The current series consists of ten bronze sculptures in editions of five, as well as some unique works in clay. The artist unveils new work on Nov. 20 and 21.